Archaeologists have discovered a millennium-old Hindu temple in northwestern Bangladesh believed to be established during the Pala dynasty, experts here said today. 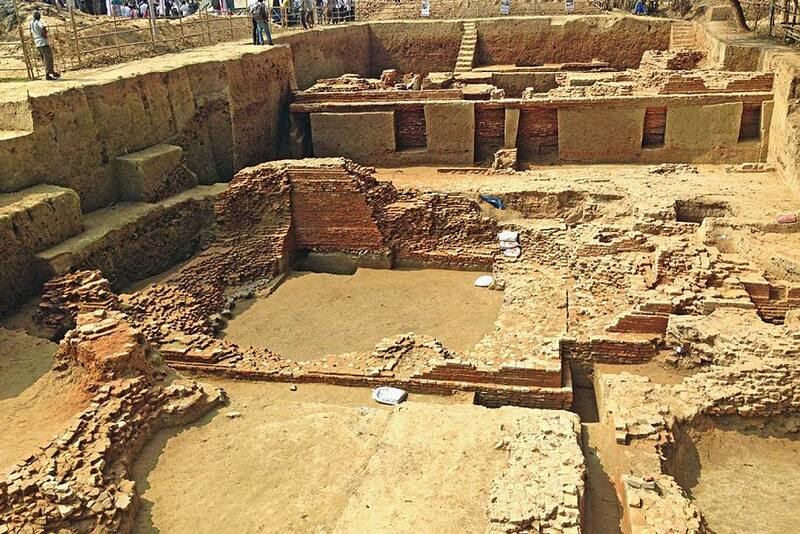 "We found the temple, excavating an area in Bochaganj area of Dinajpur," leader of the excavation campaign Professor Swadhin Sen of Jahangirnagar University said. He added the temple was believed to be built in between 8th and 9th century in this area which is now called Meherpur village of the Bochaganj sub-district. The surprise discovery came as farmers found some archaeological relics like old time bricks whir preparing a piece of land for cultivation, the Daily Star newspaper reported. Officials said the state-owned piece of land was leased out to local farmers for cultivation, who informed the university's archaeology team which was engaged in another excavation in a nearby area. Sen said they found some terracotta plaques from a trench while the solid objects on the walls surrounding the temple were overly burnt. Another member of the excavation team, Sohag Ali said they had detected idols and staircase of the temple and "we are working to dig those out". The discovery came months after the same team unearthed a Buddhist temple, built around the same time at nearby Basudevpur village, the central edifice of which was built on a platform of 45 metres. The Dhakeshwari Temple, the national temple of Bangladesh and one of the oldest in the country, was built in the 12th century by Ballal Sen during the Sen Dynasty which ruled the region after Pala kings and in popular notion the country's capital Dhaka was named after this temple. Invader Muslims(Muslim population of "Akhand Bharat"(Pakistan,Entire Kashmir,India,Bangladesh) descendant of Hindus who lived under weak,small Hindu Kings who resisted Arab or Turk invasions starting 1100AD to 1600AD) destroyed 56000 beautifully carved Hindu temples in,Pakistan ,Kashmir ,India ,Bangladesh.For ex, Qutub minar in delhi built by destroying 26 Hindu temple complex. Islam is bad religion. When it comes to supplements, the newspaper presents heaps of opportunities to target each section of population. Metro plus, Education Plus, Young World, Opportunities, Friday Review, Property Plus, Retail Plus, Classifieds and Downturn are the different supplements of The Hindu. All of them are used for accomplishing assorted advertising goals.